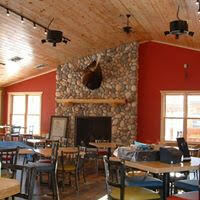 We’re a barbeque joint on the banks of the Au Sable River in Grayling, Michigan. In addition to scratch-made BBQ we feature 30 craft beer taps along with a great selection of wines and spirits, many Michigan made. Blues music is always playing, so come see us. We’re located right behind the Old AuSable Fly Shop at the river bridge in downtown Grayling.